My brain is full. It needs to digest. Hopefully, some of you were able to check out the stream of the first ProjectVRM Workshop (#vrm08) that just wrapped up at Berkman. Over 40 folks attended in person, and the overall vibe was at the intersection of "wow, this is great, needed stuff" and "ok…let’s get going!" VRM and Healthcare: Is Medical Home a Stepping Stone to VRM? Relationship Networks and the Mine! 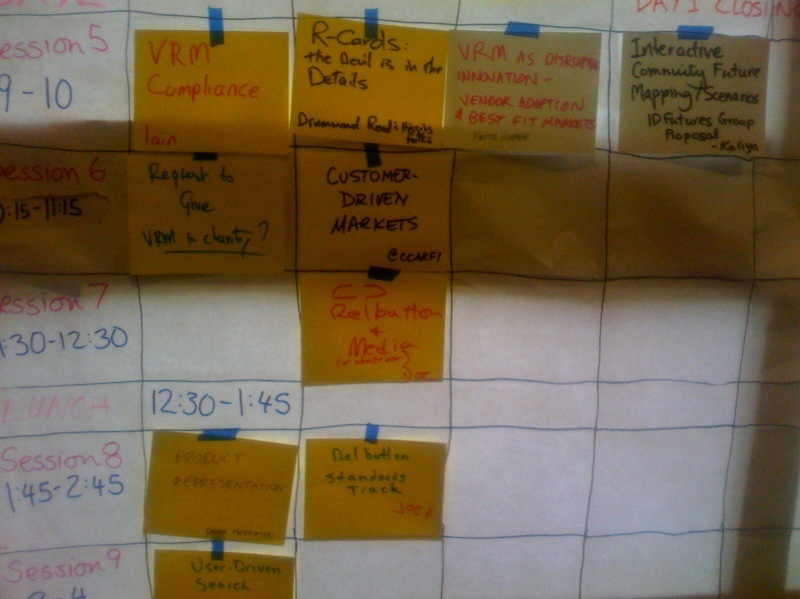 I facilited two of the conversations, "Intra-Enterprise VRM" on Day 1 and "Customer-Driven Markets" on Day 2. "Herbert Simon, economics Nobel laureate and polymath, offered a fable to illustrate how much of a modern economy is ruled not by markets, but by organizations. Simon imagined a visitor from Mars who "approaches the Earth from space, equipped with a telescope that reveals social structures." In the Martian’s telescope, firms show as solid green areas, while market transactions show as red lines, so the economy shows as a spider’s web of red lines and green areas. Most transactions occur within firms, so organizations make up most of the landscape the Martian sees. If it sent a message back home describing the scene, our Martian would not describe it as "a network of red lines connecting green spots," but as "large green areas interconnected by red lines." This was one of those "ah-hah" moments. Up until yesterday, every conversation I’d either heard or had regarding VRM focused solely across the customer-vendor interface; that is, the conversations focused on cases where each party was part of a different organization. But if Simon’s Martian-with-a-nifty-telescope fable is true, of :course: most parties who interact with each other are within the same organizational entity! A leading opportunity for VRM within the enterprise is around the idea of a "personal data store" for one’s resume/CV, skills and past experience. 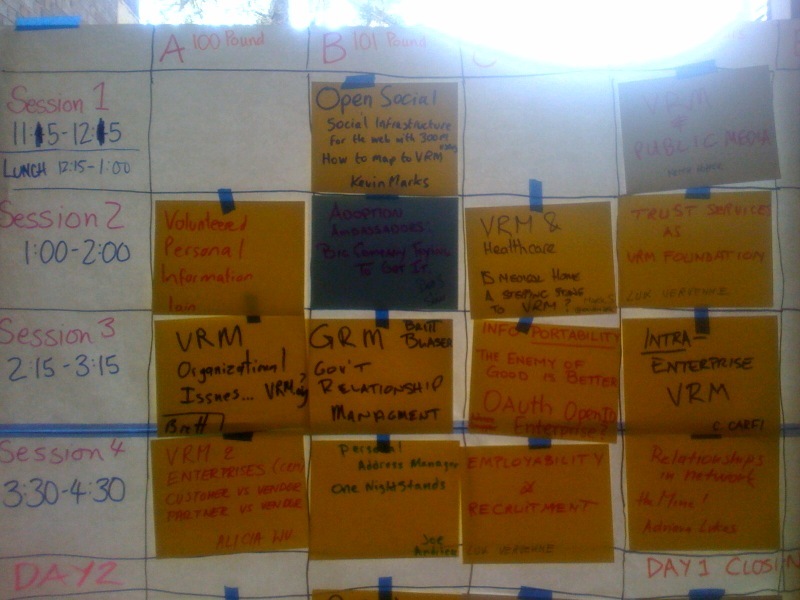 VRM could be used to enable internal "innovation markets"
It was the first item, a personal data store for one’s CV that precipitated the most conversation within this particular breakout group. The rap went like this…each individual, when starting with an organization, would be provisioned a "personal data store" on the network, along with provisioning of the normal first-day-of-work provisioning of phone number, desk, office supplies, company email address, and the like. That personal data store would be the repository of one’s experience within the organization — projects that were attempted, their results, any quantifiable objectives that were tracked along the way, etc. In enabling (and encouraging!) each individual to keep her CV up-to-date in this manner, both the employer and the employee reap benefits. The employee reaps benefits in a number of ways. First, the personal data store is portable; that is, she can export all her information at any time. So, if she were to leave the organization, she’d have her own personal record of her accomplishments, skills and experiences already up-to-date when getting ready to search for new opportunities in the market place. Similarly, someone who took the effort to clearly publish her skills via her personal data store within the organization would be more likely to be able to be matched with projects or divisions within the organization that could benefit from her skills. (N.b. The converse is also true. You don’t keep yours up to date, you have less of a chance of getting on a cool project.) Similarly, depending on how often the CV was updated, it may even have the potential to reduce (or eliminate) the need for tedious bulk status reporting — it’s already in there! All management needs to do is run a report for the updates to the CVs of individuals within a division or on a project to know what the latest-and-greatest was. The organization benefits as well. Now, there is a clear way to look across the individuals in the organization, and know what skills are where they should be, what ones are available for an upcoming project, and what ones are perhaps ready for an opportunity for new, relevant challenges. The second area we talked a bit about was the opportunity to use VRM as the infrastructure of an internal "innovation market." An example was given as follows: an engineer working on a project has hit a thorny problem that he can’t seem to solve. So, instead of banging his head against the wall further for one more day, he instead creates an internal "RFP" (Request for Proposal) that describes the problem that needs to be solve. The engineer then releases that RFP to an internal marketplace, where others with the skills, interest, time or insight to solve the problem would propose various solutions to the problem. Additionally, those within the organization who responded to the RFP with a viable solution would also be eligible to partake in a portion of the benefits that accrued to the organization as a direct result of the innovation. Despite the length of this post, it really only scratches the surface of what was discovered and discussed throughout the workshop. However, my plane is landing soon back at SFO, so this one’s a wrap. Check out more coverage of the conference at http://cyber.law.harvard.edu/projectvrm/VRM_Workshop or on Twitter tag #vrm08. Another post soon summing up Day 2, with a special focus on the idea of Customer-Driven Markets. Seeya soon. Chris – thanks for providing your perspective on key take-aways and your facilitation of the “Intra-Enterprise VRM” and “Customer Driven Markets” sessions at VRM08. I joined through streaming and found both sessions insightful and clarifying. A great two day event.